1520 Cahuenga, originally uploaded by Here in Van Nuys. A new retail space with an open air alley that connects Cahuenga to Ivar. Some of the stores include the great architecture and design shop Hennessey and Ingalls as well as, of course, Urban Outfitters. North of Sunset, south of Hollywood Bl. on the east side of Cahuenga. I think this is further evidence of sustained revitalization of Hollywood which, in my opinion, has come about because of the public transportation ease provided by the Red Line train. 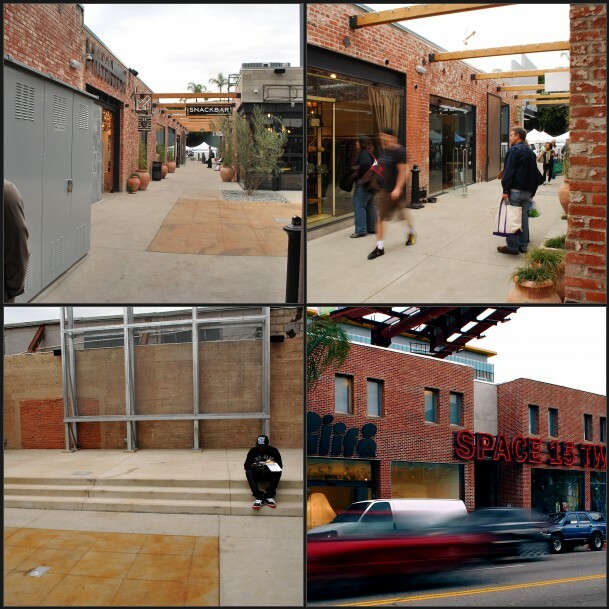 The architects have integrated these buildings quite modestly into the surroundings and connected two “lost” streets, Cahuenga and Ivar, and given them new vitality with this shopping complex. It’s also nice to see something urbane built in LA that is not centered around parking and cars. This is a pretty cool space. I’m just wondering about how it fits into the surrounding neighborhood which seems a bit run down (although definitely improving. )Perhaps it will be one of those projects that spurs improvements in the immediate area.